A Caramoor Wedding is a unique and magical experience. The Caramoor Center for Music and the Arts is an exceptional venue with spectacular gardens and grounds. The country estate was originally created by Walter T. and Lucie Bigelow Rosen to express their passion for music and the arts. The legacy of the enchanting estate lives on today in various performing arts events and in the numerous weddings celebrated at the venue. A Caramoor Wedding in the spring or summer permits guests to venture outdoors to see the estate’s picturesque landscapes. The couple pictured chose a summer wedding, allowing them to make full use of the grounds. In this photo, the bride and groom share a kiss as they stand beneath a canopy of green. 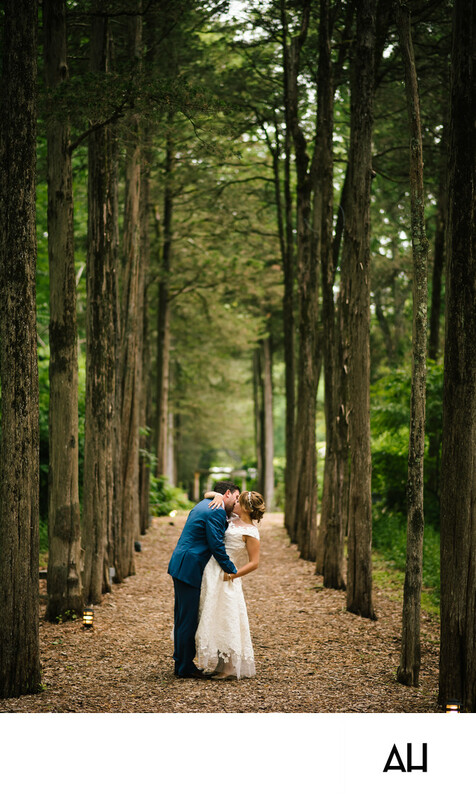 The tree lined path is an ideal spot for capturing a few quiet images of the bride and groom, as the high reaching trees and woods surrounding the path give it a secluded feel. The bride is radiant in her lace sleeved dress and the groom, dashing in a navy suit. The pair look like they could be the movie poster for a Jane Austen novel adaptation. Theirs is a love story, and this day it is the beginning of a new chapter.